Results are available from the downloads area on the left. Thanks to the Hutton family for the use of the Talland facilities. Also Emma Harford for organising and Claire Wills-Goldingham for judging. Area 14 put on a tremendous show winning or being placed in many Senior classes. Some photographs have been added to the Photos page. Jessica Downham (then of Area 6) was also well placed and we are delighted that Jessica is part of Area 14 for 2016. Thanks to the Hutton family for the use of the Talland facilities. Also Emma Harford for organising, Penny Clarke and Peta Roberts for judging. Congratulations to everyone who had a crack at the Summer Show at the weekend, here are the results (number in brackets denotes SSA Area). Thanks to the Hutton family for the use of the Talland facilities. Also Emma Harford for organising, Claire Willis-Golding for judging and Peta Roberts for stewarding. Thanks heavens this year's show was held indoors! Many thanks to this who turned out, congratulations to all those placed and the full results are available via the downloads area on the left. Emma Chinn won the trophy for highest Area 14 Member in Class 1 (Novice Equitation). Thanks to the Hutton family for the use of the Talland facilities. An excellent show at which Area 14 was well represented since there were many placings and too many to list here. The full results are available from the download area on the left and all Area 14 competitors have been highlighted. 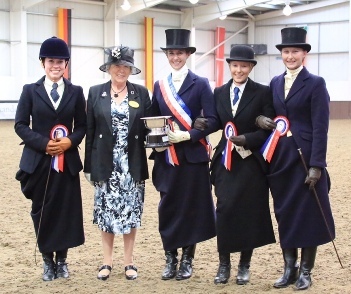 Highlights included Georgie Roberts achieving 'Junior Side Saddle Rider of the Year' and it was especially pleasing that the Area won a team event (Equitation Jumping - Georgie Roberts, Jessica Thomas, Claire Brown & Jessica Downham). 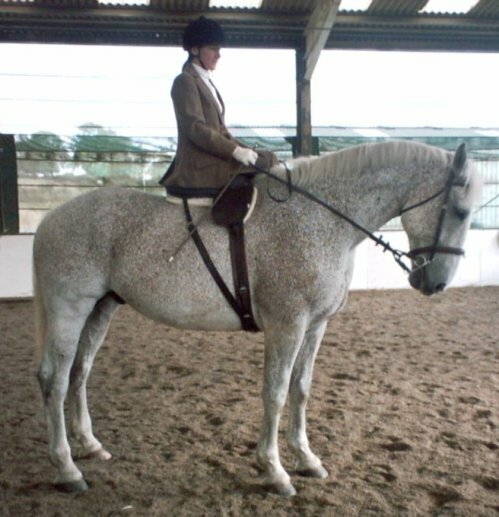 Jean Smith and Carrie Anne Ashbolt also did well in their Dressage and Elegance classes. The 'Pattie Curtis Memorial Trophy' for 'most caring Groom to a Junior Rider' was presented to Alex Bevan, Groom to Amelia Bevan of Area 4, who won the Talland School of Equitation Training Bursary. Alex is seen here being presented with the trophy by Joint-Chairmen Claire & Peta along with Area 14 Secretary Emma. 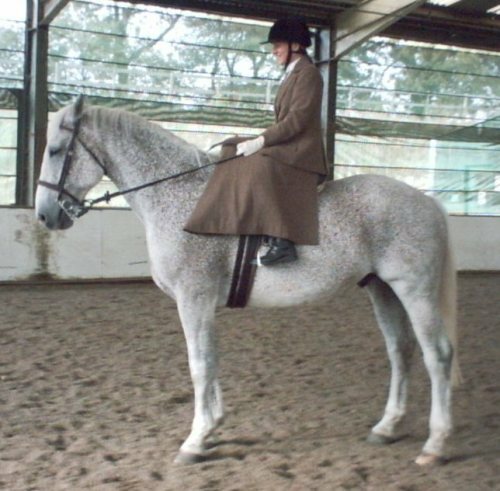 After continuing weeks of inclement weather, the sun shone on Talland School of Equitation AGAIN but thank heavens for the use of a properly surfaced school or this event may have been cancelled like so many others. A great time was had by all with competitors from several SSA Areas. Full results are available from the download area on the left. Courtesy of Lucy Hall, lots of piccies have been published on her Facebook site. 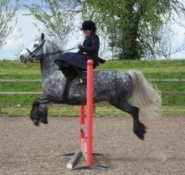 After weeks of inclement weather, the sun shone on Talland School of Equitation and a great time was had by all. Full results are available from the download area on the left. 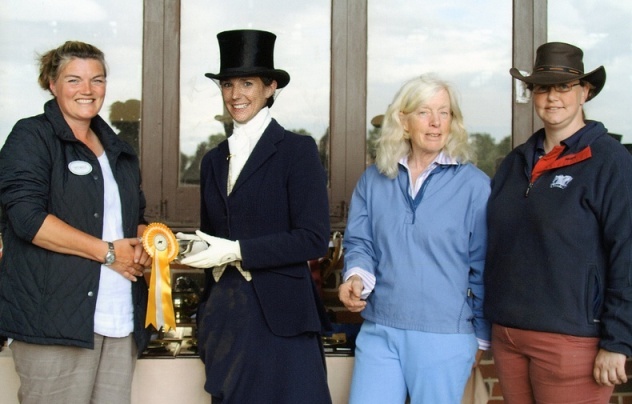 The inaugural winner of the Pattie Curtis Trophy for the "Sir Lancelot" qualifier was Jean Smith riding Sam. Lots of piccies are being added to the Photos page but this one has to be a classic!